This is a guest post by Pam Hosimer. Two keynote speakers, Don Blumstein and Charlie Saylan, who co-authored the book The Failure of Environmental Education (And How We Can Fix It), shared their thoughts on many different topics, including school gardens. Three members of a Plenary Panel discussed Hot Button topics to challenge our thinking. Daniel Soeder is a geologist with the U.S. Department of Energy at the National Energy Technology Laboratory in Morgantown, West Virginia, and presented thought provoking information about energy and environmental issues related to unconventional fossil energy resources, or “fracking”. McKay Jenkins, who just published a new book What’s Gotten Into Us? 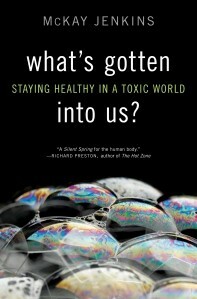 Staying Healthy in a Toxic World, presented a fascinating view of why we need to be more proactive in caring for ourselves and being aware of the choices we make in interacting with the world around us. One thought provoking fact he shared is that 400 chemicals used in the American cosmetics industry are banned in Europe. Mike Tidwell, Director of the Chesapeake Climate Action Network, spoke passionately about wind power and the reasons to pass an offshore wind energy development bill in 2012. Did you know that there are 49 offshore wind farms in Europe and zero in the USA? There were a total of 30 breakout sessions covering the entire spectrum of Environmental Education topics and concerns. We learned about spiral herb gardens, creating partnerships with other programs, ideas to use STEM to teach about watersheds and budget friendly nature crafts. Jenny and Pam each presented a session which incorporated our wonderful GIEI program. Jenny and Diane Lill, her co-worker at the Audubon Naturalist Society, presented a session called Salad Science to 30 participants. They shared the nuts and bolts of their successful elementary school program GreenKids, making it look so doable the entire audience was ready to go out and start growing salad greens! Pam presented a session called Storybooks + Kids + Gardening = Innovative Programming to 25 participants. This original program shows educators a step by step process for finding inspiration in children’s books and using that as a basis to build an innovative and enriching program for kids to learn about the natural world. This conference will be held next year at University of Maryland in College Park, MD on February 21 – 24, 2013. Please consider attending it!